Then, I came across Alexandra Ledgerwood's (Teaginny Designs) cross pillow. I just love it so much - the colors, how they combine, the space to do really cool quilting - sign me up. It wasn't difficult to figure out the math to make something similar in the specified 15" square - trust me, it really wasn't, and I'm not a math whiz! Alexandra is right when she says that strip sets rock! 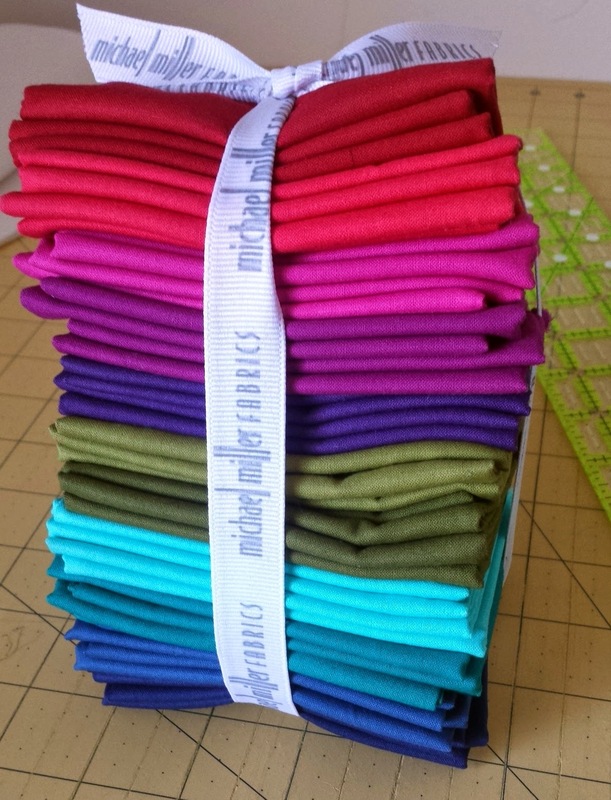 So, I took my solid strips, sewed them together in rainbow order, squared it up, and cut it in four. I did the same with the low volume/black strips except that I varied the strip widths for some interest, and that I cut in three (two small strips plus 1 long strip to be sewn vertically down the middle). The quilting was the most fun part, as it often is for me. I made some signature swirls - one of my go-to free motion motifs - and then pebbled the heck out of those little stripes. Even the really skinny olive lines got some tiny pebble action! I decided to change up the thread colors, too - all the darker colors were quilted in dark gray Aurifil, while the light colors got light gray. It's just a little bit of a difference and I hope that if my future partner doesn't read this, they'll notice it themselves one day. Just a fun little detail. The back - I had a fat quarter of Alison Glass fabric on hand and it just looks too cool with the swirls! Is it weird that I often match my backings to what I plan to quilt, for optimum visual impact? ;) Even though you definitely won't see the back of this ever, when it's hanging on a wall? Tell me I'm not alone! I love pretty quilt backs! Linking up to Fabric Tuesday @ Quilt Story, Sew Cute Tuesday @ Blossom Heart Quilts, Needle and Thread Thursday @ My Quilt Infatuation, TGIFF, Crazy Mom Quilts. You can't really go wrong with rainbows and quilters. We are likes bees to those glorious rainbows! They have everything we love and use, all organized beautifully together. Also you can't go wrong with swirls, that's an official decree by me. I love the rows of pebbles! I always like trying to match quilt backs to the front in some way, even if its random. Like how you have a rainbow mini and a rainbow back. I have a floral quilt and a back with gardening motifs. I'm preferring to hide my quilting stitches though so I don't really want anything that will show it off LOL. 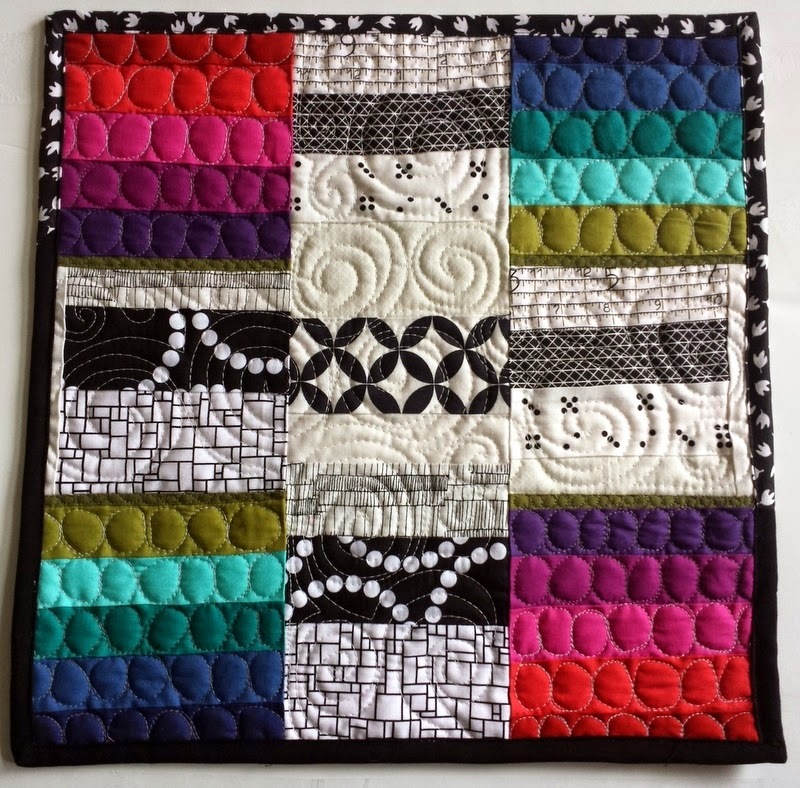 super mega love this and your quilting is gorgeous! This is a fantastic mini! 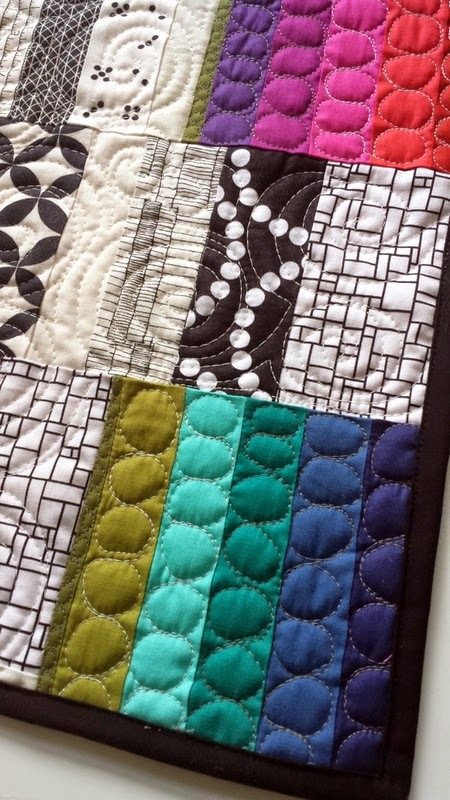 You chose a great combination of fabrics and the quilting design is awesome! Beautiful little mini! 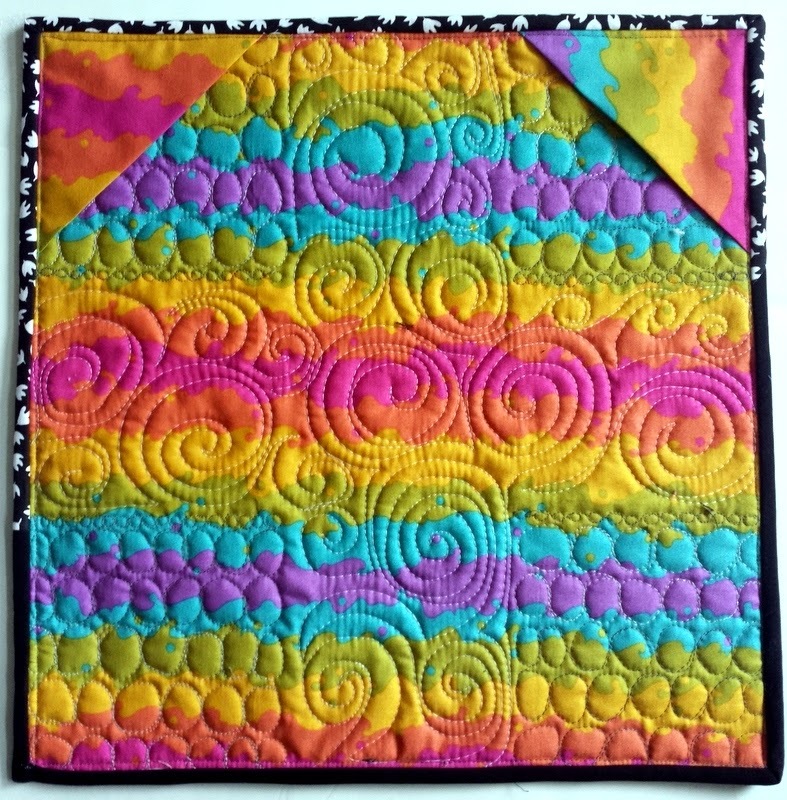 Love the rainbow colors and your quilting! WOW...that back is wildly bright and bold! It's fab- I'm sure it will make someone very happy. I love the pebbles, esp the tiny pebbles on the olive! You just can't go wrong with black & white fabrics paired with jewel colors. It's impossible! I'm sure the recipient will love it like crazy. And since you love it, too, you need to make a similar one for yourself, maybe to use as a potholder or mug rug, if you have enough small quilts to hang. Sweet take on the cross pattern! Love your graphic and colors! Nice use of all those different fabrics for a little mini. The recipient should be happy to get it. Hope you like yours as well. Beautiful quilting! Your colours are great, too. Beautiful,love the colors and the quilting, nice project, great job! Great fabric choices and very nice quilting! So I guess we should make a 'mini quilt' group, huh? I've been making them lately, too! 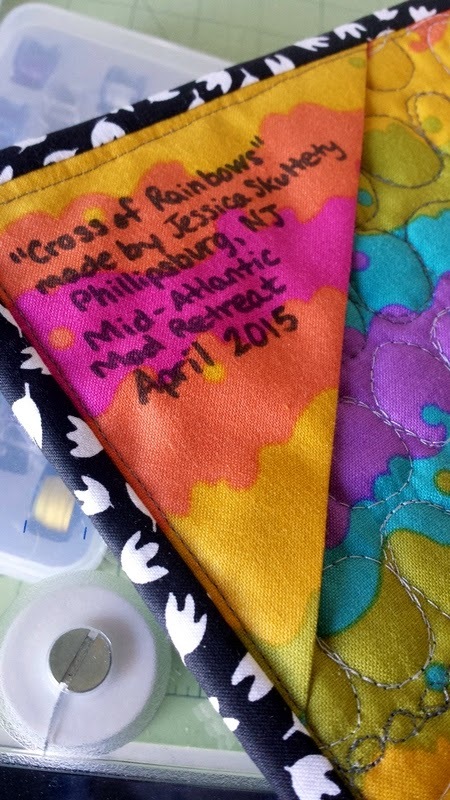 Love the quilting and the colours - great finish Jess!